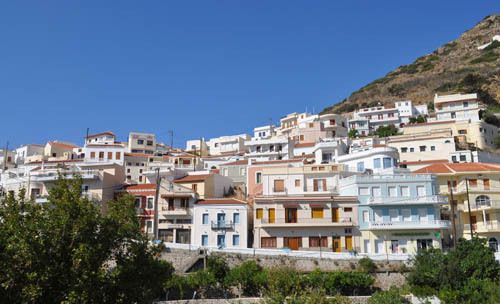 On our second day, we looked forward to exploring towns in the southern part of Karpathos. All of these are very old, but the legacy of this island goes back to a time before history was invented. 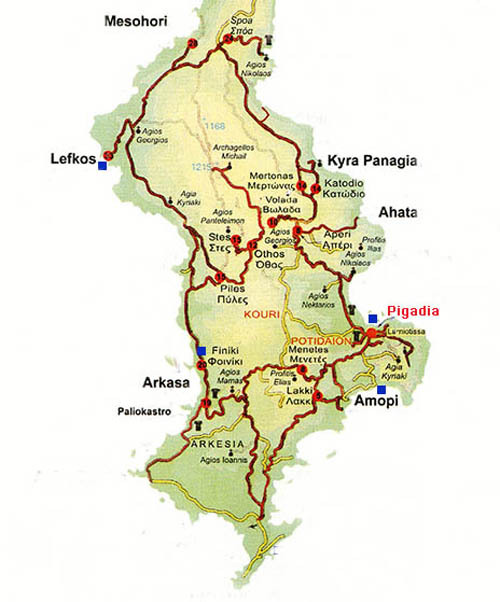 From the port of Pigadia, we went to the mountain villages of Aperi, Volada and Othos, then down the coast to Finiki and Arkasa, and through Menetes before returning to the port. Archaeologists have proved the island was first settled by pre-Greek people during Stone Age times (around 8,000 years ago). 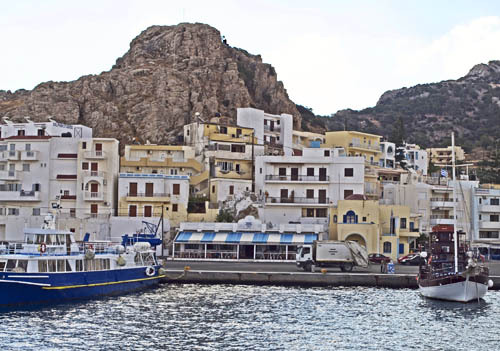 Karpathos remained obscure for thousands of years, until Minoan traders from Crete discovered a good harbor on the island and built a trade center they called Potideon. 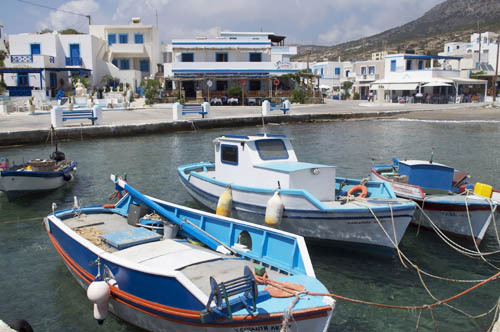 This port had a profound effect on the civilization and history of Karpathos, and it became more important as the Minoans expanded their trading empire throughout the Aegean Sea. 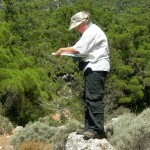 Some even believe that Minoans settled on Karpathos. 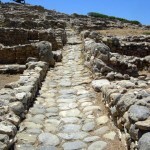 Potideon and the people of Karpathos thrived for many hundreds of years, until the volcanic eruption of Thera (http://travelingclassroom.org/?p=1960) devastated northern Crete and crippled the Minoan trading fleets. Exploiting this weakness, the Greek Mycenaeans invaded Crete and took control of the valuable Minoan trade centers — including Karpathos. The port of Potideon was renamed Poseidion (for the Greek sea god), and the Mycenaeans built a fortress on the rocky hill above the harbor. Only a few bits of the ancient walls remain today, and the only recognizable structure in the area is a temple to the goddess Demeter (Dimitra). 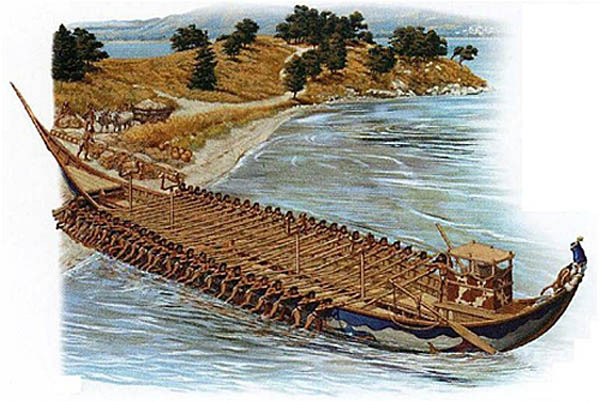 According to Homer, the great king Agamemnon (of Mycenae) ordered that ships be sent from Poseidion to assist Greek forces in the Trojan War. They defeated Troy, but within a century the Mycenaean empire disintegrated and its cities lay in ruins. 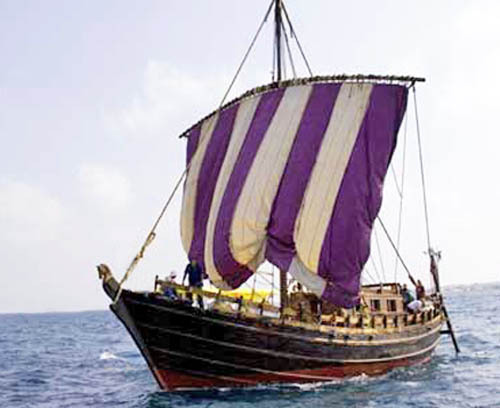 For a time, Poseidion became a harbor for other traders — enterprising Phoenicians from the Levant (around modern Lebanon). But the situation changed again, as it always does. A new power was spreading across the region. Dorian migrants arrived on the island around 1,000 BCE. They were an aggressive tribe of Greeks, and difficult to resist in battle. But when they settled an area, Dorians often integrated the local population (Karpathians still speak a Dorian dialect). The newcomers built four cities and brought prosperity to the island. 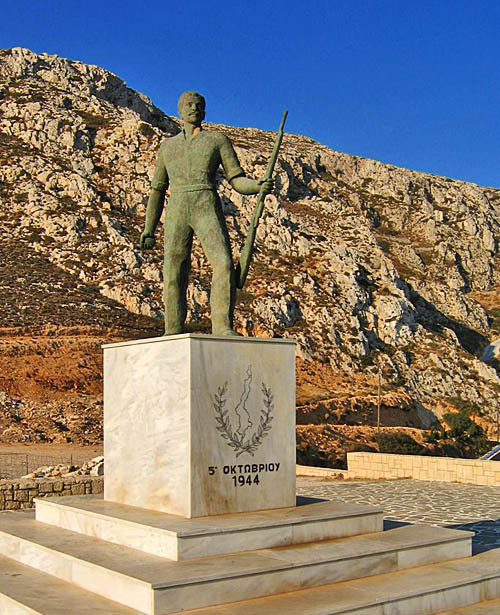 Karpathos was involved in several Greek wars over the centuries, and enjoyed self-rule during the Hellenistic period. Then various invaders came to conquer and rule: Romans, Arabs, Venetians, Ottoman Turks, Italians and others. Each left a mark on island history. Our bus departed from Poseidion (now called Pigadia) shortly after breakfast. 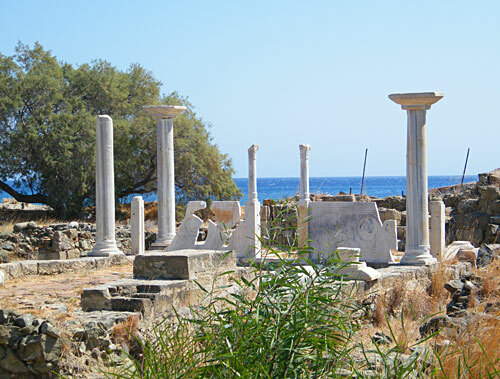 On the coast, at Vronti beach, we came to the ruins of Afoti — the early basilica of Saint Fotini. The elegant marble columns made it look like a Roman temple (remember: the Eastern Roman empire was Christian). We continued northward to the village of Aperi on the slope of Mount Hamali, surrounded by rich farmland. It was the capital of the island for nearly 200 years (during the 18th and 19th centuries). After government offices were moved to Pigadia, it remained the spiritual center — where the island’s Metropolis (main cathedral) stands. Aperi is a thriving village, filled with people who love education. With financial help from Aperitans who immigrated to New York City in the early 1900’s, they built the island’s first elementary school, high school, and lyceum (lecture hall) near the cathedral. 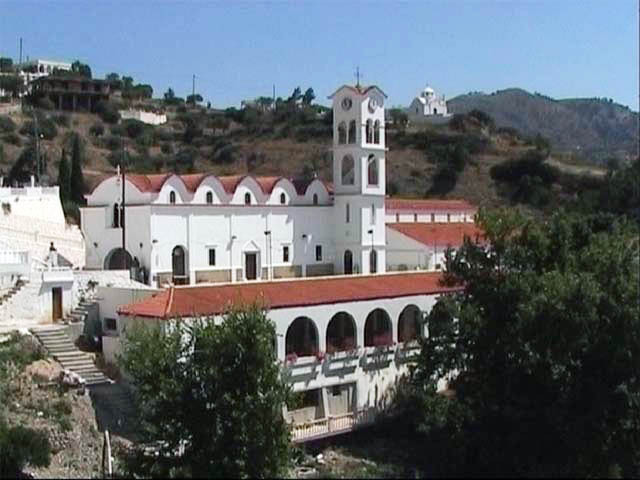 Our primary purpose in Aperi was to visit the church of the Dormition of the Virgin Mary, which is home base of the Archbishop for Karpathos and the nearby island of Kassos. Because the lane to the cathedral was narrow, our bus stopped at the bottom of the hill. Everyone had to hike up. Koraki hill was probably the site of an ancient acropolis, and a Dorian inscription found in the area indicates that a sanctuary of Apollo was located somewhere nearby. There are also ruins of a castle dating from the Venetian Cornaro family, which ruled the island from 1306 until 1538, until the Ottoman Turks took possession. A number of people were winded when we finally reached the cathedral. The interior of the cathedral was impressive — filled with brilliant wall paintings and religious artifacts. A young priest gave us a history of the church, and how the local people had raised money for its construction. One of the priest’s most intriguing stories was about an ancient icon of the Theotokas (Mary, the mother of Jesus) that kept vanishing from a small Byzantine church higher up on the mountain and appearing at the site of the cathedral. Each time it was found, it was returned to its church … only to disappear again and appear at the same location. Finally, it was decided to build the great church at that place. The icon now holds a place of honor in the cathedral. 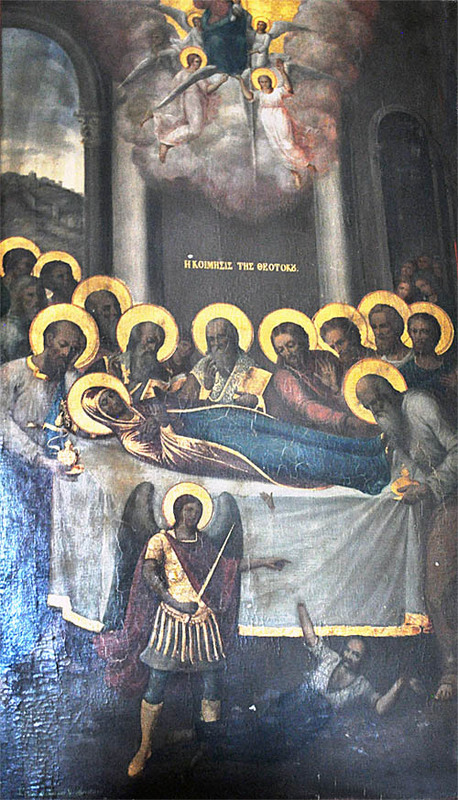 Another tale involved a painting of the dormition (death) of the Theotokas. There are many such paintings in Orthodox churches around the world. Some include the image of a man beneath the funeral bier. This is from the tale of a man who, out of hatred for Christians, tried to topple the bier. At the moment his hands touched the bier, the sword of an invisible angel cut them off. The relevance of this tale is the priest’s account of a local man who stole money the villagers collected to build their cathedral. His image is depicted beneath the bier in the painting — forever cursed by his fellow villagers. It is the only known instance of a real person appearing in Orthodox religious art. After leaving the cathedral, our bus crossed the Gefiri stone bridge, which separates Aperi from the nearby village of Volada. Built between mountains at an altitude of 1480 feet, Volada is a beautiful little village, guarded by the ruins of three castles and surrounded by farmland. However, the streets of Volada are narrow, with little room for buses to maneuver or park. So we continued up Mt. Lastos to the village of Othos. 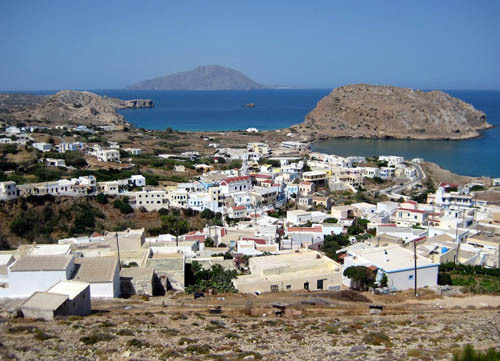 The highest village on the island, Othos offers a beautiful view to the sea. Most of its 300 inhabitants are involved in farming. The village is surrounded by trees and vineyards, which produce a famous sweet red wine. Colorful houses create a pleasant atmosphere, but there were few people about when we arrived. 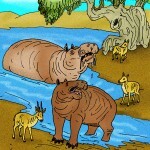 The villagers were tending their crops and livestock. After a short visit to the local folklore museum (very much like the traditional Olymbos home we visited the day before), we traveled westward through Piles and down to the coast. We stopped at the little fishing village of Finiki. Our fellow travelers scattered through the village, looking for good tavernas to eat lunch. We found a quiet place just off the harbor, and tried some traditional dishes. Afterward, we walked back to the quay, where we found an interesting monument. 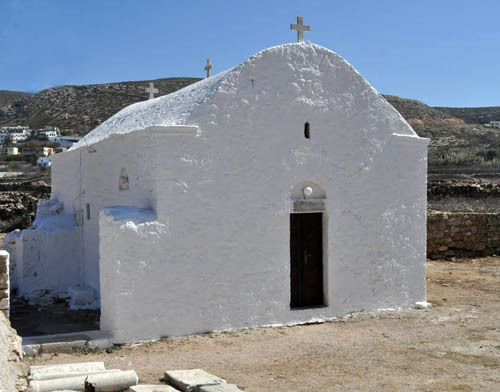 It tells the story of brave villagers who risked their lives for Karpathos during World War II. Karpathos had been occupied by German and Italian soldiers for some time. But, as the tides of war shifted, the Germans fled with all their weapons on October 4, 1944. Emboldened by this, the next day Karpathian resistance fighters moved against the remaining Italian forces. 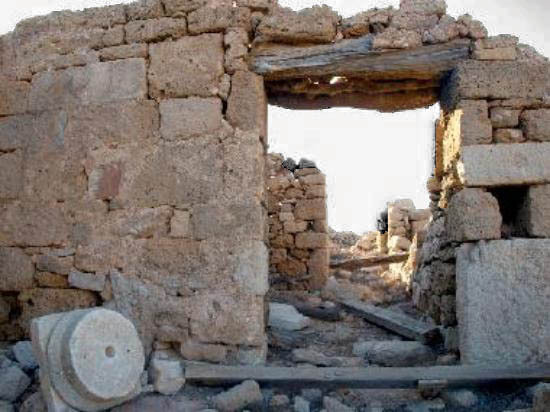 The men of Menetes attacked first, followed by the villagers of Arkasa, Mesochori and Olymbos. Soon the island was free of foreign rule for the first time 500 years. The remaining problem was that the invaders had stripped the island of food, and people were starving. Seven brave men sailed out of Finiki harbor in the Immakolata, the only fishing boat on the island with a motor. Their goal was to contact the exiled Greek government in Alexandria Egypt. It was a 335-mile voyage across rough seas in bad weather. But they did reach Alexandria, where they reported that Karpathos was free and begged for help. 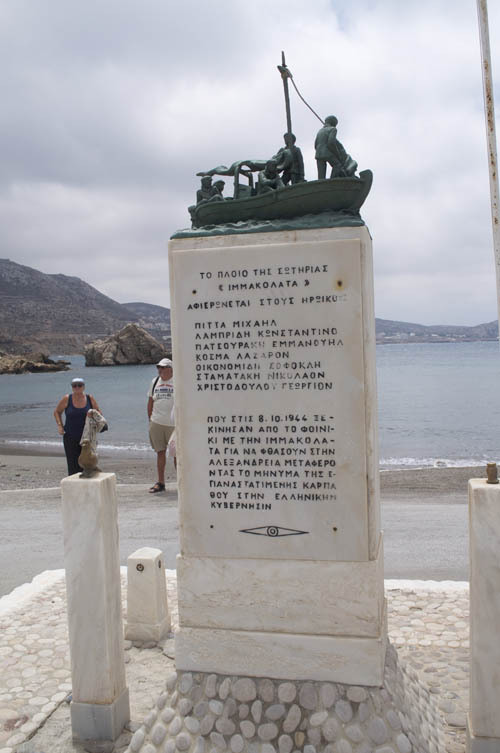 The men returned to Karpathos as heroes with two allied war ships carrying supplies for the islanders. This was the start of the official liberation of the island. 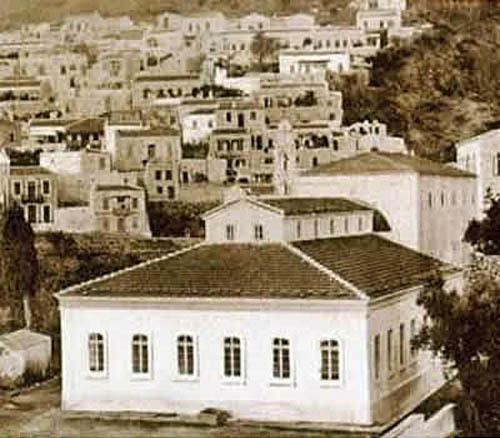 A few years later, Karpathos became part of Greece. Leaving Finiki and traveling south along the beach road we soon reached Arkasa, a village with a very long history. 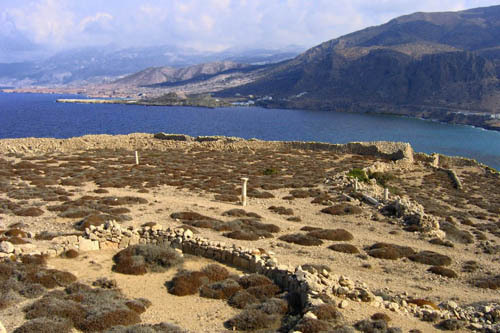 Arkesia (now Arkasa) was one of the four Doric cities of Karpathos. The Doric acropolis was built upon a rocky peninsula that juts into the sea. 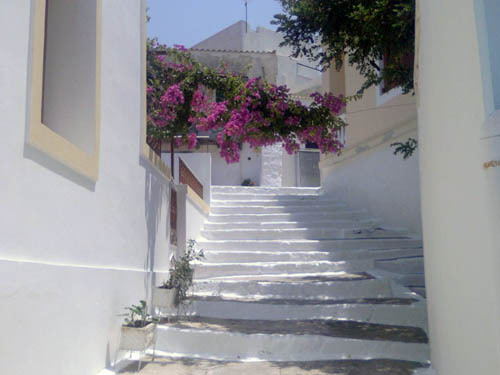 Local people call it Palaiokastro (old castle). Walking through the ancient city, an observant visitor can find many centuries of Karpathian history and different civilizations in a single place. 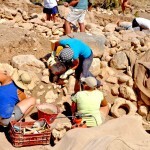 There are ruins of medieval buildings lying over enormous Mycenaean walls. Doric capitals and columns are repurposed to create lodgings, and watchtowers stand near gaping ancient cisterns. 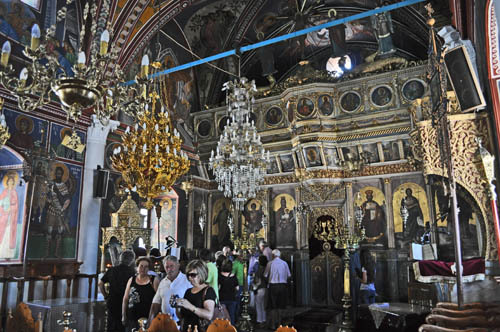 Not far from the ancient ruins, at the base of the acropolis, is the old church of St. Sophia. 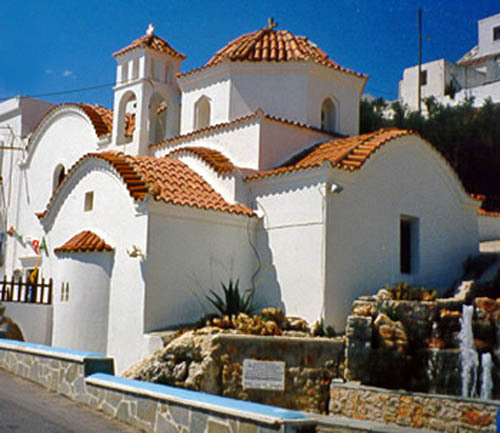 It was erected on the site of the earlier (4th-6th century) basilica of St. Anastasia, which was built using marble parts from the temple of Athena (the ancient Greek goddess), which was located somewhere nearby. This is about 3,000 years of history at a single location. After leaving Arkasa, our bus wound through the hill country to the town of Menetes, a pretty village with an excellent view down to the sea. Some of our friends went to visit the local church. The rest of us explored the narrow lanes and charming houses, often highlighted with flowers. 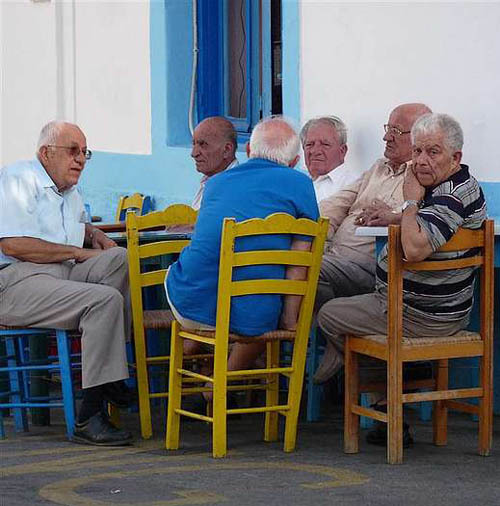 We looked for a place to have a cup of coffee, and found one occupied by elderly retired men. They might have witnessed the rebellion against occupation forces during World War II, and rejoiced when their island become part of Greece. After finishing our coffee, we joined the others boarding the bus. No far outside of town, we came to a war memorial overlooking the sea and Pigadia in the distance. 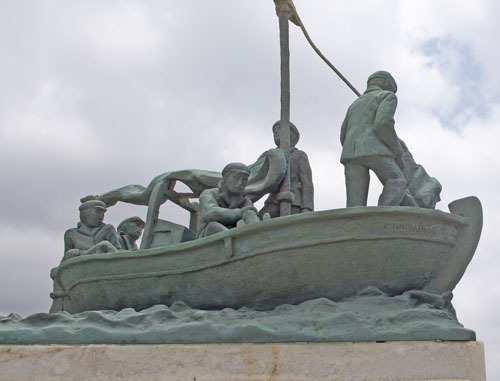 It honors the Menetes resistance fighters, who in 1944 were the first to strike out against the occupation forces and win freedom for their people.